1. 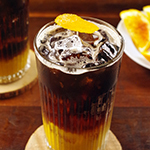 In a mixing glass combine all the ingredients with ice, except beer and shake vigorously. Serve over the rocks in a beer glass and top with dark beer. Garnish with lemon.